Say hello to the coolest cup ever. 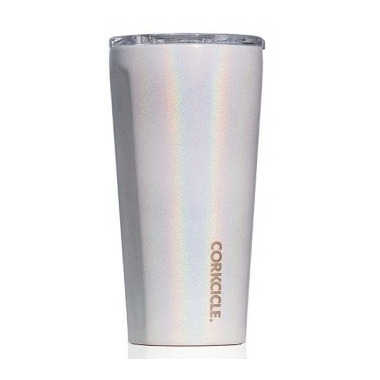 The Corkcicle Tumbler is crafted from stainless steel with proprietary triple insulation, this vacuum-sealed wonder cup just doesn't quit. It keeps your beverages cold for 9+ hours and hot for 3. It stays cold even longer with drinks containing ice even out in the sun. With its easy-grip sides, no-slip bottom and shatterproof, drink-through lid, you'll enjoy stylish, spill-free sipping every day. Includes 1 Tumbler + 1 Tumbler Lid. Love everything from this brand. Great quality. Keeps coffee hot and cleans nicely. They are also beautiful! Amazing product. As a busy mom of two toddlers, this keeps my coffee hot all morning. No need to drink cold coffee anymore! :) Comfortable to hold and drink from and washes easily. And its SO pretty! Great tumbler for coffee, keeps my coffee hot for up to 3 hours. The only downside is that the lid isn't leakproof. Would recommend!